In the past, homeschooling has been non-existant in our house during the summer months. But last fall, as we started school I realized just how much my 3rd grader had not retained from the previous school year. This was frustrating and I made a note to do thing differently this year. In preparing for this summer, I decided we needed a different plan of action. I wanted to do a little school, but still make it feel like summer…not like we were doing school all year long. I chose some books that we hadn’t gotten around to studying this year and bought some new things. One thing I purchased were Brain Quest workbooks, one for my 3rd grader and one for my Kindergartner. My kids have loved working on these this summer. The are really thick workbooks that cover tons of subjects. 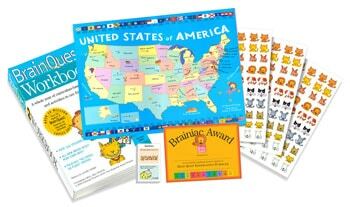 We have really enjoyed using Brain Quest workbooks this summer. They’ve provided just the right amount of supplication to enrich the kids over the summer months. The stories and illustrations are fun as well, providing a great backdrop to wonderful content. Alicia is a homeschooling mama of 3 little students. During the summer months, you can find her at the pool with her kids, studying nature, or blogging on her personal blog: La Famille. I’ve always loved these books, but (more importantly) my dc loved them, too! My only complaint? They only go through fourth grade. I’d dance for joy if Brain Quest would publish summer skills books for older students, too!